Our journey through space travel science fiction has our coordinates locked onto the 1950’s The most Ultra of the Ultra-Swank decades. Receding in our aft view screen is the pulp pre-war period of the 1930’s and 1940’s – the times of cowboys in space. They rode rockets instead of horses and blasted bad guys with ray guns instead of six-shooters. Our mid-century destination is where the science in science-fiction takes over the controls! We land squarely in the realm of motion pictures- mostly black and white and often projected on the mosquito obscured screens of drive-in theaters. The plots may still be thin, the dialog contrived and the budgets no bigger than a plutonium neutrino but it’s all arc-welded together by the blazing brilliance of the the god in the white lab coat- The Scientist! This is the height of the Cold War and the near vertical climb of American consumerism. Any moment science will end all life on the planet- but in the meantime let’s get that new Hydramatic Futurific Buick with the built-in color TV dishwasher! Rest assured that nothing in these movies has anything to do with real physics, astronomy or any of that other complicated stuff. There is always a part of the script where a scientist explains science in a scientific sounding way- often accompanied with a chart. It’s all just long words and scowls and professors puffing on pipes. Then the movie gets back to the alien slime monster and other good stuff. Exceptions to the rule: here is an unusual example from 1950’s truly scientific “Destination Moon”. The whole movie can be seen here. 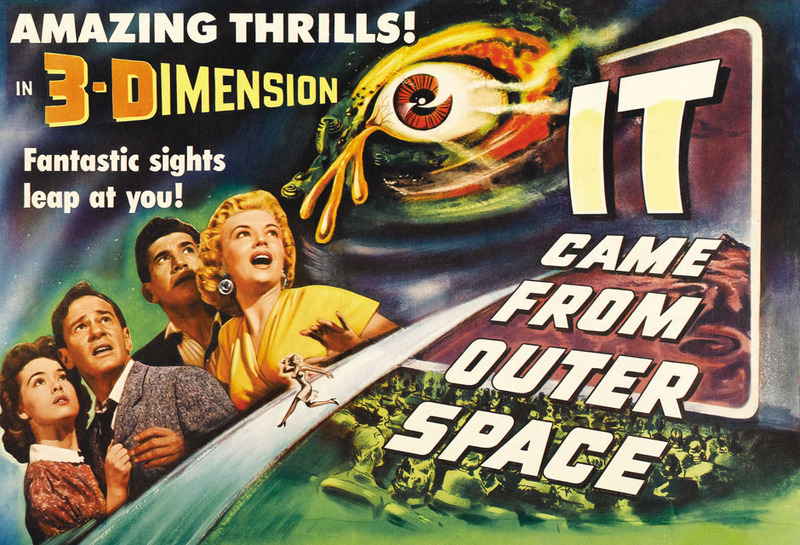 The space themed 1950’s ‘B’ science fiction movie came in two flavors. There was the one where the aliens came to visit us- and the ones where we went to see them. Sort of like grandparents- only with lots of screaming and tentacles. If the aliens were coming to see us then there were scenes of Generals in Pentagon offices hysterically urging scientists in labs to develop a last minute weapon. This amazing scientific weapon would make the aliens want to go back home- they were destroying our cities, experimenting on our women and drinking all our beer. This new scientific breakthrough had to be done without spending special effects money. Maybe an ultrasonic beam that only required some high pitched warbling on the soundtrack. Viewers believed it because they had tube powered hi-fi’s in the den and ‘ultrasonic’ had that science ring to it. “Earth vs. the Flying Saucers” is a shining example of of the deadly ultrasonic beam principle. Psychologists tell us the world menaced by alien invaders was a metaphor for the threat of atomic war…also bed-wetting and male pattern baldness. There was plenty of pathos and terrified crowds running and a lost child or abandoned puppy amongst it all. It was all pretty predictable unless it was a sci-fi film from some crazy place like Great Britain. Then things were all mixed up and the alien was a hot babe in PVC who needed a bunch of guys in a pub for breeding purposes. If it was a movie about going into space then another formula was followed. A young hero scientist would talk an old rich guy into paying for his new brussel-sprout powered rocket ship. Government space agencies did not exist yet and it was the American Way to rely on private enterprise and ingenuity. Often the old rich guy would go along even though he had a secret medical condition that would kill him off at an inconvenient moment. There was also the beautiful niece of the old rich guy. She just happened to have a PhD. in atomic physics. She would would make coffee, scream when monsters appeared and prove she could do real science just like the men. Then she would make sandwiches to go with the coffee. To complete the crew there was a requirement for a mechanic who knew how to fix rockets but could otherwise hardly spell his name. He would play the harmonica. Sometimes the young hero scientist would bring along a colleague and rival who would compete for the affections of the pretty scientist niece. He would sacrifice himself to save the others and so the hero would get the girl. Different movie, different actors- same crew. There were many moments of scientific danger awaiting our outer space crew. Terrific forces of acceleration, far worse than ever experienced by real astronauts, crushed our heroes into grotesque, gurgling special effect wonders. Swarms of meteors, attracted to any unsuspecting rocket ship, lurked at every slow plot point. Despite all the slide rule calculations there were always little slip-ups- like not packing enough fuel or none of the crew had ever landed a rocket before. Spacesuits were whatever was available from the Army-Navy surplus store. Alien planets looked a lot like the hills twenty minutes outside of Hollywood. Outer space cities were always conveniently hidden underground and resembled the leftover streamlines of a Busby Berkeley musical. The alien cities were usually filled with a population of beautiful women who needed Earthmen to replenish their population. It was all great fun… and still is!